Juan Giraldo is a photographer born in Manizales, Colombia and raised in Paterson, New Jersey, where he currently lives. He received his MFA in Photography in 2015 from Columbia College Chicago and his BFA with a concentration in photography in May of 2009 from William Paterson University. 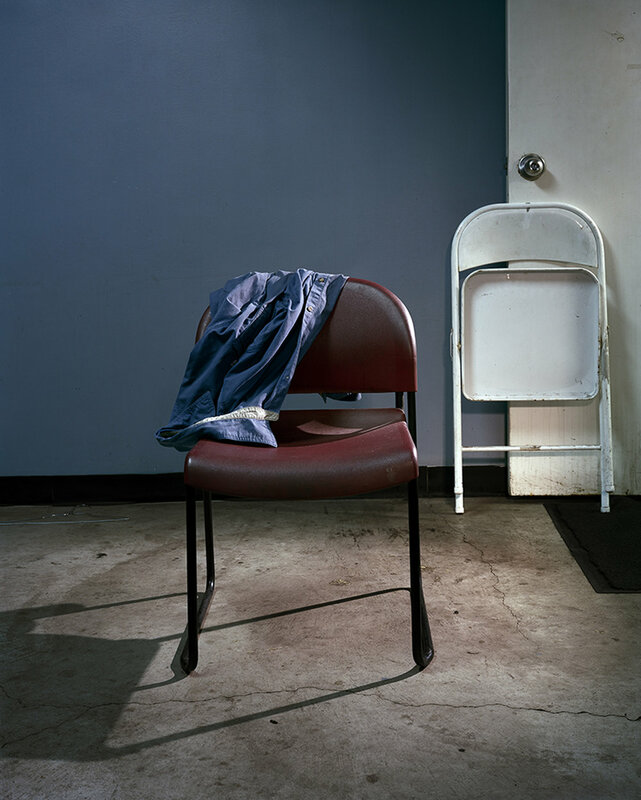 His work explores the personal interior spaces of working people, the textures of a working life, and the banal indicators of domesticity that shaped his view of the world, both as a first-generation immigrant and laborer. Jess T. Dugan: Let’s start at the beginning. What inspired you to be an artist and what led you specifically to photography? Juan Giraldo: My love of animation (it’s how I learned English)! I stole a camera (a Vivitar to be exact) from the department store I was working at when I was about 18/19 years old. I had no idea how to use the thing; I later took a very basic photo class in community college. Soon after I transferred to a four year school where I had some amazing instructors, in particular Ronnie Sacco & Bud (Robert) Glick (Glick & I are still friends to this day). I made some really awful work back then. I never relented. I took pictures like it was my job; I had this internal drive to just keep shooting. Around 2007 I began to photograph Parker Shoe Service on East 18th St. in Paterson not far from my neighborhood. After making pictures there for over a year I felt as if I had found my voice as a photographer/artist. JTD: If I understand correctly, you come from a working class, Latino background. I imagine moving across the country to pursue an MFA in photography was not what was expected of you. What was that transition like, and how did your experiences growing up affect your work? JG: That is correct! I am Colombian born and raised in the Riverside section of Paterson, NJ. I’ve worked full-time since I was a teenager, a lot of manual labor jobs, mainly as a carpenter, house painter & prop maker among other things. I think that as long as I went to college they were ok with what I did (especially after I told my mother what my day rate was as a photo assistant). Transitioning from a working life to that of a fully immersed artist wasn’t difficult but definitely new. I went from being the guy that would clock in at six in the morning (like many of my subjects) to work in similar spaces, to showing up in the middle of the morning to make pictures as I wished; it was a welcomed departure. My experience growing up always manifests itself in one way or another; especially when I first started making images in Great Lakes Reload. I began to recognize interpersonal relationships between everyone there; it was very familiar to me (particularly because of my time as a carpenter in a sign shop). At one point or another you become family. JTD: As you mentioned, once in Chicago, you began photographing the Great Lakes Reload (GLR) on the city’s far southeast side. In a recent interview with It’s Nice That, you describe the GLR as “a 385,000 square foot warehouse that transports, stores and processes various type of steel products; sheet, plate, bar, beam and tube products.” What drew you to this particular location and group of people? JG: My interest in this particular space and group of people is/was both practical & poetic. Practical in that this type of environment was familiar to me having been raised in proximity to so many factories and warehouses. Poetically speaking (both figuratively & literally) the work of Philip Levine and seeing people like my Grandfather file in & out of these spaces reminded me of Fritz Lang’s Metropolis. I wondered when and if they would ever come out of these monoliths (this sentiment became more poignant when I joined the labor force). As I worked in these spaces over time, there was a certain rhythm that kept me sane. I learned to look at all these vignettes that would later begin to lend themselves to this drama of the mundane. JTD: In addition to photographing the dockworkers at work, you also befriended many of them, following them home to photograph their personal lives as well. What was your process like for gaining access into their lives and building their trust of you as a photographer? JG: What helped me gain their trust was that I didn’t just go in to GLR to make pictures. I always took the time to talk to everyone and I would sit down for lunch with them at work. But ultimately what (I think) gained me access to their personal lives & homes were my persistence and a few images I made of my parents, which I shared with them. It made me look vulnerable and not just the photographer from Jersey, or the Colombian guy, as some of them called me. JTD: The photographs in your project Blue & Blue are beautifully made and depict your subjects with dignity and humanity while also speaking to their specific identities and circumstances. Can you describe your process for making your photographs? How collaborative are your portraits? For the still life images, what draws you to particular locations or scenes? JG: Thank you! Sure, my process is practical at first and then the poetics follow. I get to know my subjects a good deal sometimes over the course of a few years (many of them have come to call me family) or in as little as five minutes, but for the most part it’s a very collaborative experience. My physical process is slow because I use a 4x5 field camera to make my photos. My still lifes function in a similar fashion. I see these objects on any given visit and more often than not I’m drawn to them, at times for what they are (they might stir up a memory from childhood or something like it), and at other times for the stories behind them. JTD: You have previously stated that, as a Latino photographer, you feel it is important to create photographs and narratives about people of color from within your own community as opposed to being depicted only by outsiders. How important was your own identity to your series Blue & Blue? JG: I think about this quite a bit! My identity and experiences have helped me a good deal because they have allowed me a level of empathy with my subjects. I’m a first generation immigrant; I grew up in a similar environment and a host of other things. JTD: You began this project many years ago, before we could have predicted the tension of our current political and social climate in the United States. I imagine it is possible that it has only deepened your resolve to make this work, but I also wonder if you or your subjects have experienced any negative repercussions that might interfere with you making the work going forward. Have your feelings about the work itself- or the need to make it- changed in any way since the current election? JG: The current state of affairs in this country is very troubling. I don’t think that anyone foresaw this or thought that this was possible; it feels like some alternate universe or better yet living in the actual Twilight Zone. Absolutely, even before the election I held on to a personal mantra “brown people are middle and working class too,” an idea informed by my friend, artist Angela Davis Fegan. As of now, to the best of my knowledge, neither my subjects nor myself have experienced any negativity as a result of the work. My feelings about the work are as strong as ever if not stronger. If anything, the current political environment has solidified my commitment to this project and the people in it. JTD: After receiving your MFA, you moved back home to New Jersey. Does this imply that this project is completed, or is it something you will continue to work on in a new location? 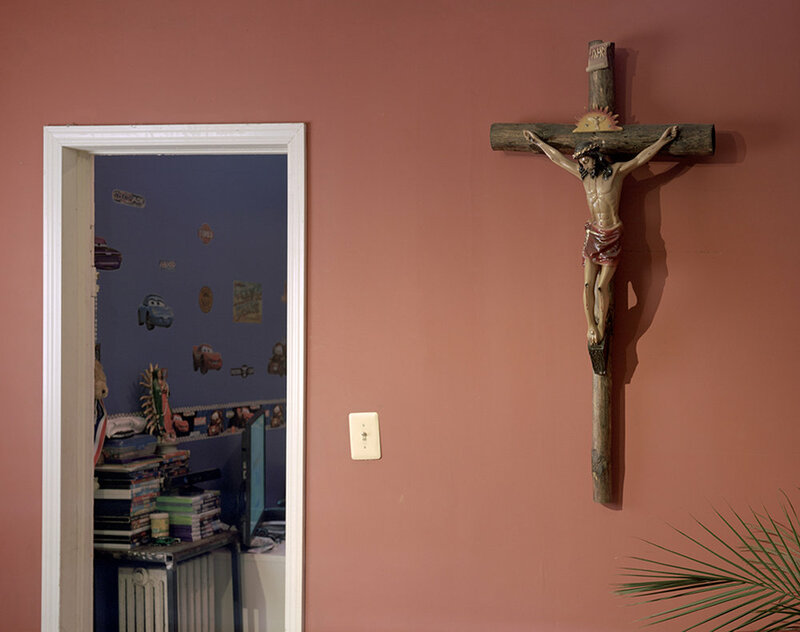 JG: I moved back to Paterson, New Jersey in January of 2017 to spend some time on my other body of work E. 17th St. which centers around my family and to begin photographing Paterson in earnest. So Blue & Blue is only on hiatus for the moment; I plan on spending some time in Chicago this summer. I didn’t feel like I needed to stay in Chicago to keep working on this project. Before I left, I received this piece of advice from Dawoud Bey: “we carry our ideas & concerns with us…wherever we go.” Working on different projects helps keep my mind fresh & the gears turning. JTD: Lastly, what’s on the horizon for you as an artist? JG: To rule the world! Just kidding; I recently completed an edition of 25 artist books titled “A View from Home”. I’m in the process of researching publishers to have a trade edition of “A View from Home” published. I have a residency coming up in May (I’m not at liberty at the moment to disclose any specifics). I also have a solo show in the fall at Waubonsee college in Illinois, a group show in April in Colorado as part of the Critical Mass 2016 top 50, and a group show in Wilson, North Carolina as part of Eyes on Main Street. I’ll also be a teaching artist there as part of the festival. Alongside a few other artists, I will be working with kids from the Save a Youth program, teaching them photography after school the first week of April. Most importantly, I plan to keep making work! JTD: Thanks so much for speaking with me, Juan!